November 07, 2016 at 2:50 pm. Alabama has another defense for the ages. But the Crimson Tide ultimately will be carried by a true freshman quarterback. Nick Saban’s crew took LSU’s body blows in a slobberknocker of an SEC game Saturday night and somehow still remained standing with its arms in the air. Alabama survived to win 10-0 and remained a virtually undisputed No. 1. The Tide’s defense gathered up LSU running back Leonard Fournette and stuffed him into a bottle. It made mincemeat out of Tigers quarterback Danny Etling. LSU had six first downs and 125 yards. But as spectacular as Alabama quarterback Jalen Hurts has been at times this season, he’s still a true freshman. And true freshmen are, at times, going to look like true freshmen. Saban made the decision early in the season to do what nobody thought he would — go with the inexperienced dual-threat in a four-man competition. There is no turning back now from this Saban evolution. 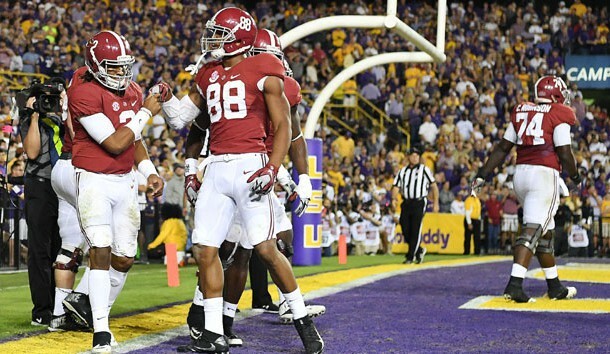 Hurts was 10 of 19 for 107 yards, with one interception, against LSU. Almost half of that yardage came on one throw. Yet after three scoreless periods, he dashed into the end zone on a 21-yard scramble and later took a designed run 23 yards on third-and-15, leading to a short field goal at the end of a back-breaking 15-play drive that took nearly 10 minutes. We know Auburn awaits in what could very well be a winner-takes-the-SEC-West Iron Bowl. After that … Michigan? Clemson? Washington? Each of those teams has the kind of defense, the kind of pressure-causing line, that can, does and will flummox freshman quarterbacks. Hurts hasn’t been your typical true freshman. Maybe he has for parts of games, but not for an entire game. And that has saved Bama. Hurts is the Most Interesting Man in College Football. He’s the biggest X-factor in the national championship race. What will he do next? 1. Washington should be No. 4. OK, we get it. The CFP selection committee, correctly skeptical of unbeaten Washington’s strength of schedule, elevated one-loss Texas A&M to No. 4 in its initial rankings. Then the Aggies suffered another loss Saturday. Meanwhile, the Huskies just kept rolling, smashing California 66-27. The temptation now will be to move one-loss Ohio State over Washington. Don’t do it. Huskies are legit. 2. Are the Huskies really legit? Fine. That’s to be determined. Their home game against USC (winners of five in a row) highlights this Saturday’s soft national schedule, and a season-ending trip to Washington State (winners of seven in a row) awaits in a potentially epic Apple Cup. 3. Bad seasons happen to good programs. Everyone figured Michigan State would take a step back from its playoff heights of a season ago. A step. Not a giant leap. The Spartans have lost seven consecutive games, and if losing at Illinois isn’t rock bottom, falling at home this week to Rutgers would be. 4. Nebraska might not want a rematch. The Cornhuskers suffered a 62-3 beatdown at Ohio State on Saturday night, thus slamming the door on their improbable playoff run. Nebraska also ceded pole position of the Big Ten West to Wisconsin, which holds a head-to-head overtime victory. 5. We need Louisville in the playoff. The one-loss Cardinals were rankled to be just No. 7 in the initial CFB rankings. Then they went out and beat up Boston College 52-7, with Lamar Jackson accounting for seven touchdowns. Louisville might not deserve the playoff because it won’t win the ACC Atlantic, but it also won’t seem right if an 11-1 squad misses the final four because it came up 3 yards short of the end zone in the final minute against Clemson. 6. It’s not a surprise when Navy beats Notre Dame. The Midshipmen had lost 43 consecutive games to the Irish before winning in 2007. Now, Navy has won four meetings in the past decade, wrapping up a 28-27 triumph Saturday by controlling the ball for the final 7:28 with its triple-option attack. If Navy’s Ken Niumatalolo isn’t on your short list of best coaches in college football, you’re not doing it right. 7. Bet on Arkansas. The Hogs love November and beyond, going 8-3 after October in the past three seasons, but merely posting a 13-11 mark before then. Included in the Novembers to remember were back-to-back shutouts of LSU and Ole Miss in 2014, and Saturday’s 31-10 shut-down of Florida. Next up this Saturday is LSU. 8. The writing is on Mark Helfrich’s wall. The rumor that Oregon must deal with, initiated by a tweet from ESPN’s sports business reporter Darren Rovell, is that Nike founder and Ducks mega-booster Phil Knight is ready to pony up $10 million or more for a head football coach. Oregon dropped to 1-5 in the Pac-12 on Saturday after a 45-20 loss to USC. 9. Texas is building momentum. The emergence of running back D’Onta Foreman — 341 yards against Texas Tech on Saturday, including 74 on a run when he lost a shoe — has helped Texas post a two-game winning streak that helps protect coach Charlie Strong from the torch-and-pitchfork crowd. And the Horns’ maligned defense actually came up with key stops and timely turnovers in a 45-37 win Saturday. Our vote: Stay the course with Strong. 10. Notre Dame is not making a bowl. The Irish are 3-6, with games left against Army, Virginia Tech and at USC. Athletic director Jack Swarbrick insists Brian Kelly will be back in 2017, but the full temperature of this dumpster fire has yet to be determined. 1. QB Lamar Jackson, Louisville. The biggest landslide in Heisman history was Ohio State’s Troy Smith (91.63 percent of the available points) over Arkansas’ Darren McFadden (31.67 percent). Jackson is headed to an even bigger margin. 2. QB Jake Browning, Washington. We’re not convinced his teammate, receiver/returner John Ross, isn’t the better player, but this is mostly a quarterback award. Browning tossed six touchdown passes versus Cal — three to Ross — and leads the nation in passing efficiency with a rating of 202.8. The FBS record is 191.8, set by Wisconsin’s Russell Wilson in 2011. 3. LB/RB/RET Jabrill Peppers, Michigan. He lined up in seven different positions, including returner, in a 59-3 victory over Maryland. He made five tackles, one for loss, and was involved in a trick play in which he took a handoff, threw a lateral to quarterback Wilton Speight, who then completed a 40-yard pass. 4. QB Deshaun Watson, Clemson. A week after leading a comeback win over Florida State, Watson left early in a blowout against Syracuse because of a shoulder injury. Just a precaution. He’ll be fine. 5. RB D’Onta Foreman, Texas. With 341 yards against Texas Tech, he took over the national rushing lead from San Diego State’s Donnel Pumphrey. Foreman is averaging 180.8 yards per game, needing to ride a potential late Texas surge to get the respect needed for an invite. 1. USC at Washington (Saturday, 7:30 p.m. ET) — The Trojans, since putting redshirt freshman Sam Darnold at quarterback, have played as well as any team in the Pac-12. 2. LSU at Arkansas (Saturday, 7 p.m. ET) — The Hogs have won the past two meetings, allowing a total of 14 points. 3. Auburn at Georgia (Saturday, 3:30 p.m. ET) — Auburn QB Sean White sat out the first half against Vanderbilt on Saturday because of injury, but came off the bench to lead a 23-16 victory. The SEC East is 1-9 against the West. 4. Baylor at Oklahoma (Saturday, noon ET) — Baylor has lost two in a row and just gave up 62 to TCU. This game has lost a lot of luster, but it’s still next up as the Sooners try to become the first team to go undefeated in conference play since the Big 12 dropped to 10 teams in 2011. 5. Cal at Washington State (Saturday, 10:30 p.m. ET) — Settle in for some late-night entertainment as two Air Raid teams fill Martin Stadium with flying footballs.